A week or two back, a cousin drew my attention to Lords of War, which is a card game about fantasy races beating the living snot out of each other. My cousin says he plays this a load with his son, who is a couple of years older than Miss B, and he thought we might be interested in it. The commander of the Elves surveys the battlefield in order to decide where to deploy her War Tiger (which looks uncannily like Battle Cat). The game comes as packs containing two decks of cards and a playmat, the first to be released being Orcs versus Dwarves. Knowing how much Miss B likes elves, I went and bought a copy of the Elves versus Lizardmen set. The game basically involves taking it in turns to place cards, which represent the troops in your army, onto a gridded playmat in such a way (usually) that they are attacking an enemy card. Attacks are basically indicated by numbers and arrows pointing out of the edges of the cards so, for example, if your card had an arrow and the number 2 pointing out of the top right corner of a card, then that card will launch a strength 2 attack in that diagonal direction once it is in play. Each card also has a defence strength, and once attack points exceeding the defence are brought to bear on a card, that card is destroyed. Some cards have ranged attacks which complicate things a little, but it remains a simple slug-a-thon where the aim is to destroy a certain number of the enemy troops. We halved the number of kills required in order to have a quicker game. Once in play, cards don’t move around; they just sit there, attacking anything that gets put in their way. However, it is possible to take a card back into your hand if it is not currently engaged in combat. The game played pretty quickly for us, our first game taking a little over half an hour, which I thought was pretty impressive. Miss B got to grips with most of the game very quickly, helped by the fact that the attacks are easily visualised thanks to the arrows. Only the ranged attacks caused confusion and I’m still not sure Miss B has really got her head around it, but I’m sure she will. Of course, a bonus for morale came from the fact that after I had an early lead, Miss B managed to catch up and even figured out quite a neat manoeuvre to beat me with by taking one of her stronger cards back into her hand in order to redeploy it for a killer blow. The box, by the way, says that to find out why these armies are fighting you can go to the website. At Miss B’s request we did just that and found that there were background stories about the game world and pages with details about all the characters on the cards. Miss B was very much impressed by this and spent a little while happily finding out about her elves and telling me about them. To wrap up, I’ll draw your attention to the Kickstarter for the new Templars versus Undead set, which is another stand-alone playset containing two decks that can combine with the existing sets. Maybe worth a look. 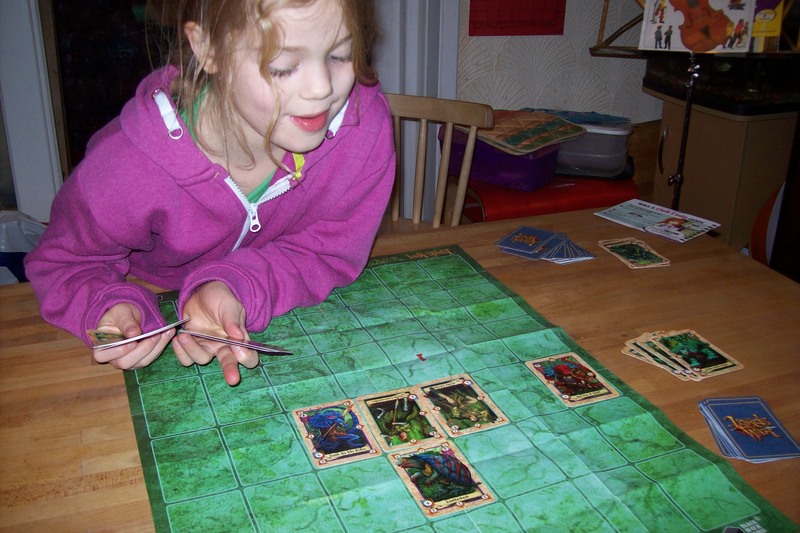 The game: Lords of War, Elves versus Lizardmen (Black Box Games), 2 players aged 12+. Smash Up is a card game that, over the last year or so, seems to have carved quite a niche as a comparatively quick and light card game of smacking your opponents with strange card combinations. 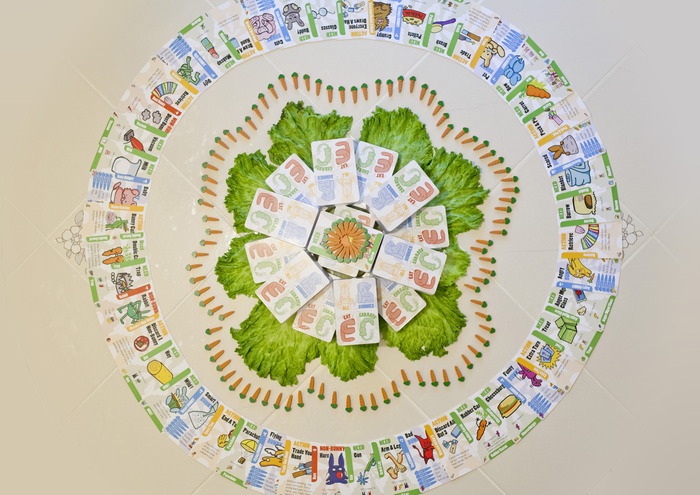 The idea is that each player picks two decks of cards, each representing a faction much loved by geeks, like dinosaurs, pirates or ninjas, and shuffles them together in order to do battle in an entirely trivial war with the other players. And so you can have Ninja Robots versus Zombie Pirates if you like. Miss B looks smug about the chaos being caused by her Zombie Wizard hordes. Some combinations are better than others, but to be honest I haven’t yet played the game enough to have got my head around the best options. I’m sure that will come soon enough. What is important, however, is that this purchase was made at Eclectic Games in Reading, where Miss B spotted the ludicrously silly box and pretty much decided straight away that she wanted it. Yup, she chose it and this is where her taste is heading. Whatever happened to Sleeping Queens?! The rules are pretty simple. You play up to one action and one minion each turn; minions get played on bases; when enough power points (from minions) are stacked on a base, the base breaks and people score victory points. Well, that’s the basics, but most cards have some effect which twists stuff around a bit (or a lot), so it can be possible to play several minions and actions. I like this game, and it very much looks like Miss B does too. However there are a couple of drawbacks. 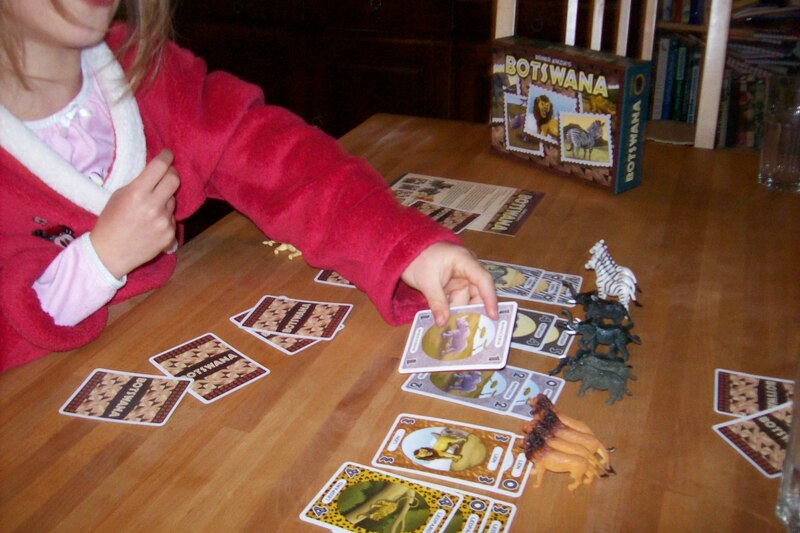 The first is common to many card games where the cards are text-heavy and have assorted weird effects: basically, until you know the game well, an enormous amount of your turn can be spent staring at your cards and wondering which could combo with the other stuff you have available, and with Miss B this can add quite a bit of time to a play. In our second game, Miss B was playing with Zombie Wizards, which is a pretty epic combination which often allows you to do an awful lot of stuff each turn, which made for a pretty long game as she figured out what to do. That said, she was figuring most of it out herself and playing some pretty decent combos from time to time. This problem will, of course, reduce with time and more plays as we both get used to what is on the cards and in the decks. My second issue is possibly a bigger one, and is basically the amount of calculation required to see if a base breaks. Most of a time this isn’t a big deal: your minions add up to 12 power, mine to 7, the break point of the base is 18, so boom! Once in a while, though, you get situations where you have Armoured Stegs (which have higher power on other players’ turns) and War Raptors (tougher when teamed up with other Raptors) on one side and a heap of Microbots (some of which do weird increasing of their power when en masse) on the other, all making for a lot of adding up to be done each turn. It’s not a deal breaker for us, but even though Miss B is pretty good with numbers, I need to help out quite a lot with this. I think this one’s a keeper though. 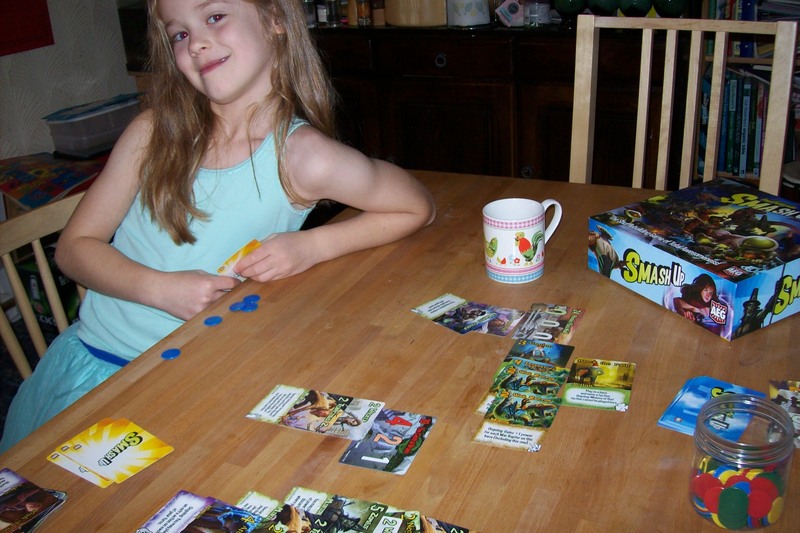 The game: Smash Up (AEG), 2 to 4 players aged 12+. Continuing my spell of catching up on recently introduced games we finally come to Frog Juice, another one of those cute card games from Gamewright. Seriously those people at Gamewright should be given medals: while there are some weaker parts of the range, they still manage to put out some pretty decent games which are head and shoulders above the run-of-the-mill stuff that is usually peddled as kids’ games, and (and here is the really great bit) they are available in mainstream toy shops. These guys rock. Not needed for a spell, but maybe take the unicorn anyway…? Anyway, Frog Juice is a game about collecting magical ingredients, casting spells and doing sums. Due to the mathematical element I would compare it to Sleeping Queens, but here the sums are a bit more integrated into the theme as they are about trading spell ingredients (the value of ingredients on one side of a trade must add up to the value of the card on the other side). Frog Juice is also a little more complicated than Sleeping Queens, but the only time this game us trouble was on the first play, and the issue we had was on Miss B’s understanding of the scoring. All in all this was a good find for us. I don’t think it runs quite as smoothly as Sleeping Queens, but seems a little more interesting and looks set for plenty more plays. I’m looking forward to trying it with more than two players some time as that could get nicely chaotic. 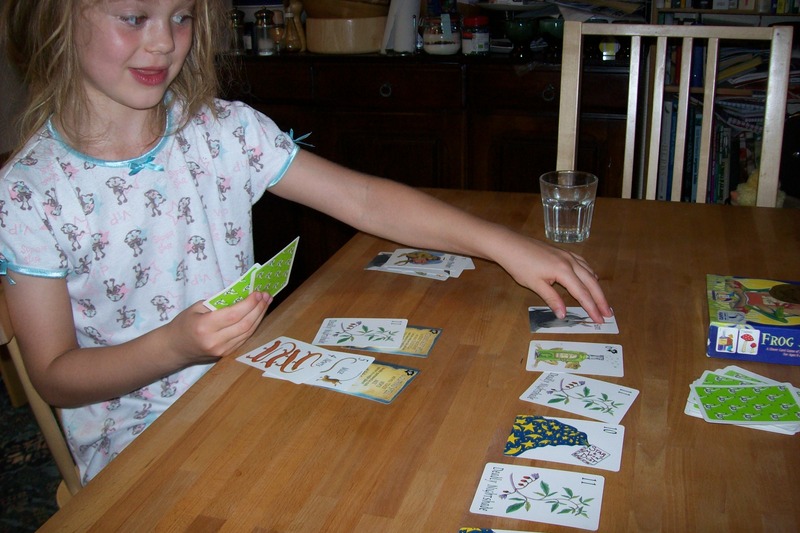 The game: Frog Juice (Gamewright), 2 to 4 players aged 8+. By Toutatis! These Romans are crazy! So, that’s another centurion captured by little druid Getafix. The game is basically a simultaneous bid auction, where players all have a hand of numbered cards (bearing a picture of their chosen Gaul from the books: Asterix, Obelix, etc) and play one of these face down in an attempt to win (or not) the Roman card that has been turned up. Whoever plays the highest card captures the Roman, which is worth a certain amount of victory points. You get bonuses for sets of Romans, and there are pirates who make Romans escape at the end of the game, plus everyone has a Dogmatix card that gives them a special action instead of their bid, but only if only one Dogmatix is played that turn. There’s not really much to this game, but there doesn’t need to be as it is pretty quick and slick. There can be a nice bit of bluffing and guesswork as you try to build the most valuable sets of captives or force the pirates on your opponents. All good stuff, and the Asterix theme seems to have really captured Miss B’s imagination. I gather this was released in English in the dim and distant past, but our copy is in German, which isn’t a problem, though the names of some of the characters don’t match up with what we are used to: e.g. Crismus Bonus is Gaius Bonus — which, unless I am missing something (entirely possible, my German is vestigial at best) suggests to me that the German translators of the stories took the punning names less seriously than the English translators. We’ve had a few plays of this so far, so I wouldn’t be surprised if it finds a place in the pile of regular go-to games. The game: Asterix das Kartenspiel (FX Schmid), 2 to 5 players aged 8+. 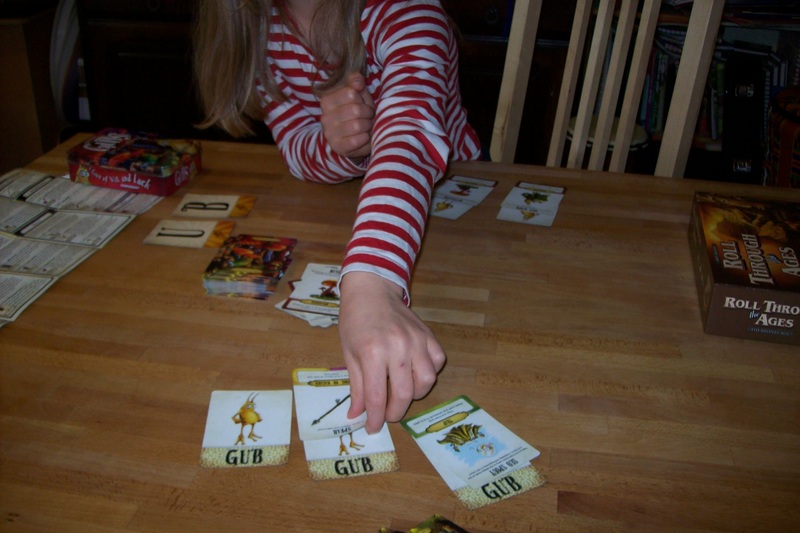 I must admit that when I first heard of Gubs, I thought it looked cute, but didn’t think it would be a hit in our house as it is a lightweight card game with loads of chaotic attacking other players, stealing or destroying their resources. Boy was I wrong. The description I’ve just given is about right but the “take that!” aspect of the game turned out to not be a problem. Throwing spears at gubs is not a good way to make friends, young lady! This game is basically about trying to have the most gubs (cute little bug-like critters) under your control at the end of the game. This involves playing gub cards in front of you, protecting them with barricades (like mushrooms), luring your opponents’ gubs to your side with shiny things or trapping them in soap bubbles or with shiny rings (which they feel compelled to hold on to), or use a number of dirty tricks to tip the balance in your favour. One disadvantage of the game is that there is a fair bit of text on some of the cards and you need to figure out how and when to play them. Miss B was soon taking this in her stride, though, and revelling in wiping out my barricades and luring my poor, hapless gubs over to her side. Gubs is really a very chaotic game, with massive swings happening in play, occasionally due to random events that you really can’t do much about and which could mean that you lose all your cards and have to miss your turn. But, you know what?, we don’t care. There have been a couple of occasions when Miss B’s lower lip has quivered at the way things have gone, but that has never lasted more than a moment and often another turnaround has happened soon afterwards. She keeps coming back for more and over the last couple of weeks this has been, by some margin, our most played game. 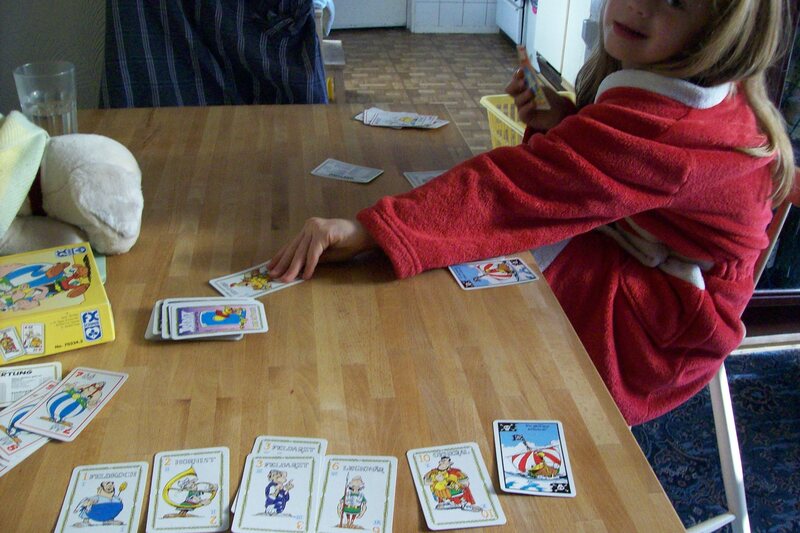 The game: Gubs (Gamewright), 2 to 6 players aged 10+. Categories: Games Tags: Alex Medeiros, card game, Cole Medeiros, Gamewright, Gubs, take that!